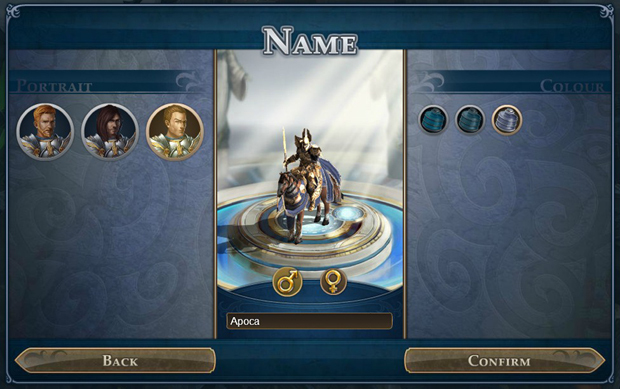 Might & Magic Heroes Online is a new take on the browser strategy game genre. It’s a 2.5D game that has elements from both turn-based RPGs and browser-based strategy games, all set in the wonderful Might & Magic setting. The game has been brought to us by Ubisoft’s Blue Byte Studio. 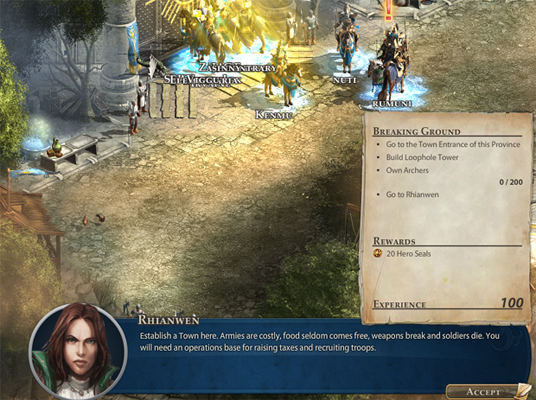 The game features customizable heroes, a large world, and the ability to do co-op battles. At a glance, Might & Magic Heroes Online should be an awesome addition to the Might & Magic franchise with a familiar retro feel to it. The customization in the game is honestly pretty sparse. You’re not given much in the way in options during character creation and a majority of the customization appeared later in the game. When making your character, you’re able to choose between two factions; the seemingly good Haven and the evil Necropolis. Each faction has two classes, which seem to be mirrors of the classes available in the opposing faction. The classes can be summed up as Knight and Cleric. Not much to work with, here. Like I said, you’ll be customizing your hero after character creation for the most part. This customization will mainly come in the form of the ability trees that are available to you. Whenever you level up, you are given a point to spend in the six different ability trees. These trees are split into different tiers that have different requirements that must be met to put points in that tier. For example, you will need to spend three points in any of the trees to be able to start putting points into the second tier of any of the trees. So, that means even if you want to focus on the Warfare tree, you’ll need to split your points up before you can start spending more than a single point in the tree. The graphics in Might & Magic Heroes Online are best described at 2.5D. The environments are 2D, but certain elements are either 3D or have a 3D-like appearance to them. This gives the game a very retro feel, reminiscent of some of the early 2.5D MMOs that were released a decade or more ago. Some might be turned off by that, but I know a lot of people will also enjoy it. However, although I enjoy the nostalgia effect the retro graphic style has, I have to admit that things could have been a much higher quality. When you’re not in battle, the game makes use of point-and-click movement. It does have some odd hotkeys – H for the character screen, rather than the usual C, for example. The UI in the game felt clunky – it seems like something you would expect from the early days of browser gaming. Not as responsive as it could be, but just enough to get by. In the end, the controls were just fine but that’s it. 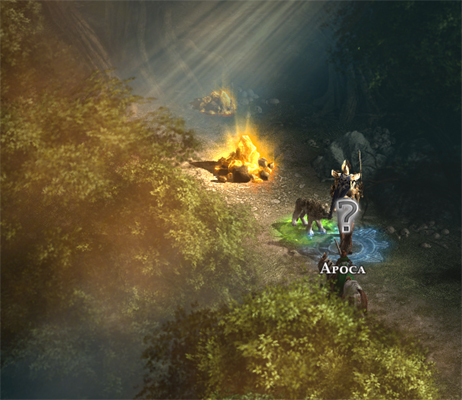 The community in Might & Magic Heroes Online is similar to any browser-based MMORPG. There are a lot of younger players in their teens mixed in with a few older people who mostly keep to themselves. I didn’t notice anything horrid in the game’s chat channels, but there were a few things that did make me cringe. All my questions were answered, though. So you probably will not have to worry about finding help if you’re confused about the game. 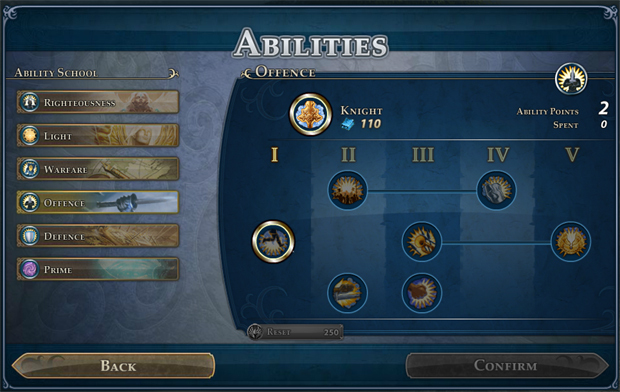 As I said in the introduction, Might & Magic Heroes Online combines elements from a few different genres. There’s a sort of town-building and army-management system, but also turn-based combat and RPG elements. The game gives you the ability to battle alongside friends, and takes place in a persistent online environment. So it would be a Strategy MMORPG? An ORPGS (S for strategy)? Something like that, anyways. 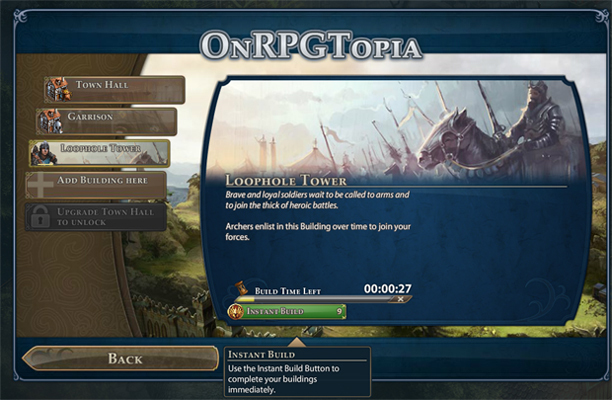 The strategy portion of the game comes from the ability to “Build” a town. In this town you can build things like barracks or special training facilities for certain types of troops. You can also upgrade these buildings to make them more effective. However, as nice as this sounds on paper, in reality you’re not given much freedom at all. It’s a fairly linear part of the game, and you don’t even get to “design” the town or place the buildings – you do it all through a list interface, which is pretty boring. So while it’s a nice addition, it’s an addition that could have been done better. The game has RPG elements, so you’ll be able to level up your hero. As you level up you’ll be able to purchase new abilities (as I explained under Customization). You’ll also gain equipment from defeating opponents, quests, or through purchases. This equipment will either upgrade your heroes own stats, or the stats and abilities of your troops (referred to as Creatures in the game, for some reason). This is one of the areas I think the game did quite well for itself. There are quests to complete, most of which consist of talking to certain NPCs and battling others. The world seems pretty interesting, though it’s mostly a linear path. But that’s most games, so I wasn’t surprised. As you travel, you can find random piles of gold or other loot to pick up. Some of this loot will only be available to you if you’ve defeated the NPCs guarding it (such as a pack of wolves protecting a large pile of gold). These little touches help make the game a bit more enjoyable, so they were appreciated. Combat in the game is a bit more in-depth than you would initially think. 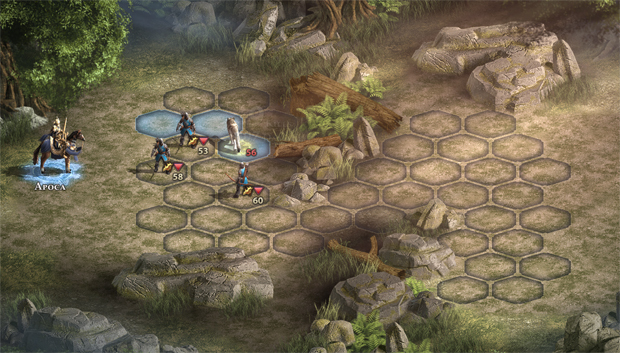 As I mentioned above, the game has strategy elements and one of those elements is the ability to train troops. Once you’ve trained those troops you can add them to your army and split them into “stacks.” It is with these stacks of troops that you will do combat, with your hero leading them into battle. So, if you’ve trained up a hundred and fifty archers, you could then split these archers into three stacks of fifty and these stacks would act as “units” within the battle. When that stack takes damage, a certain amount of those archers within the stack will die off. There are tactics involved in the combat. Troops have their own special abilities, along with your heroes’ abilities, so there can be a bit of planning of what troops you want to take in certain battles. There is the ability to maneuver your troops behind or to the side of an enemy unit to perform a flank, which gives bonus damage. Also, if you (or the enemy) manage to get a stack close to a ranged enemy unit, you can force them into melee so that they cannot use ranged attacks. This all adds up for some interesting battles, although a vast majority of the battles seem to be fairly boring. 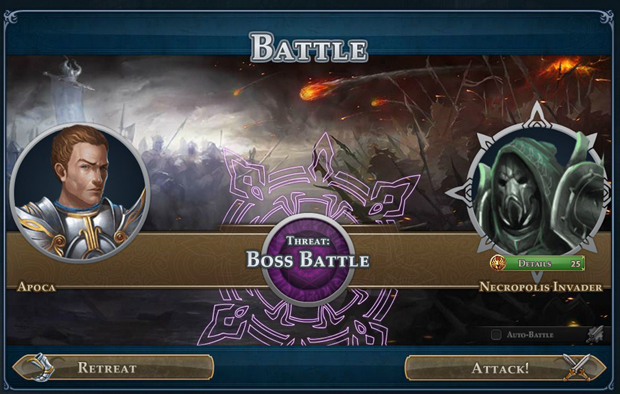 While most battles are made up of armies like your own, you will come across “boss” type characters from time to time. These are super-powerful opponents who only have one “unit” in their stack but instead have a lot of HP. So, while a boss may only have one “creature” in its stack, you will have to do a lot of damage to kill them. This can be difficult to accomplish when you consider there are other, regular, stacks on the field you must also fight and defend against. 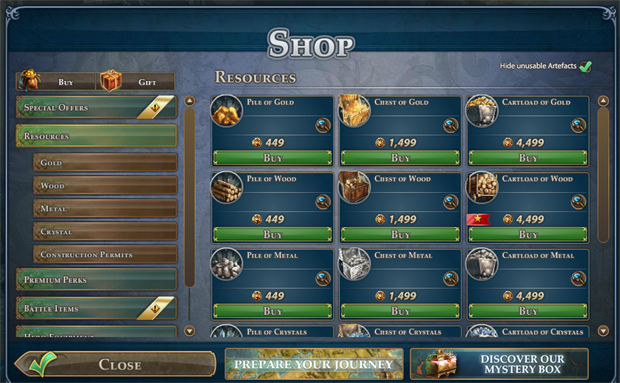 As with most F2P games, Might & Magic Heroes Online has a cash shop. Something a lot of people ask before they try a game is “will the cash shop be P2W?” P2W being Pay-to-Win, or the act of using real money to gain significant advantage in the game. Well, the answer to that question is yes. If you are willing to shell out some money, you will definitely be able to progress further into the game at a much faster rate with a lot less effort. However, to me, doing that is only going to harm your experience in the long run. However, if your end goal is to be a high-ranker in the game’s many rankings, you might find what you are looking for by paying out a lot of money. Fun isn’t the same for everyone after all. As the game is browser-based, and as far as I can tell PvP isn’t much of a thing, I believe the publishers decided they could get away with a lot when it comes to the cash shop. You can buy materials, auto-battle passes, potions, equipment, and gold as well. Just about everything you need to soar through content completely unhindered. About the only redeeming feature of the cash shop is that things seem to be quite inexpensive, so just putting in $5 or $10 will get you a majority of the things you could want. Might & Magic Heroes Online is a pretty unique browser-based strategy MMORPG. That doesn’t necessarily mean it’s amazing, but it can be something fun to play from time to time. Especially if you’re a fan of the Might & Magic series of games. 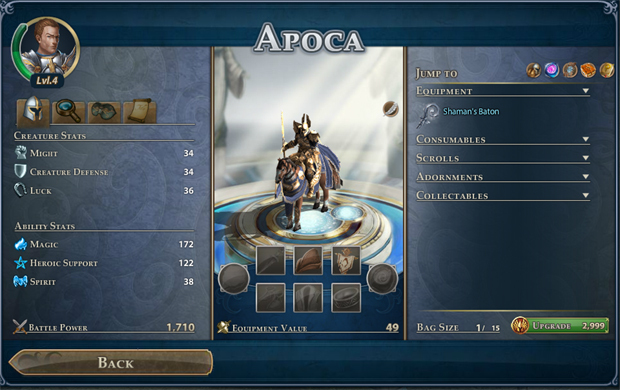 It’s got elements from a decent number of different genres – strategy, RPG, 2.5D MMOs, and more. Definitely worth a try, if you’ve got some spare time and are looking for a new game to play. Features: 3/5 – Some interesting stuff, but some of it isn’t done as well as it could be. Customization: 3/5 – Some customization, however I feel there could be more. Graphics: 4/5 – Personally, I like the retro look and feel of the graphics. Controls: 3/5 – Mostly pleasant, but improvements in the UI are needed. Community: 3/5 – Fairly typical online community. Overall: 3/5 – It’s a good MMO, and worth a try, but it won’t be blowing you away. Vainglory, the hit mobile MOBA title has just hit update 2.12, which brings with it a new 5v5 mode.